This time two years ago, beneath the dull winter skies (much like this morning’s), my thoughts turned to summer. Turns out, I wasn't the only one. The Madison Area Parents & Community Facebook page exploded with requests for summer day camp recommendations. To help make the search a little easier on all of us, I compiled several themed lists of day camps on A Madison Mom, all within a relatively short drive from Madison. Now I’m updating each list for the 2019 summer. 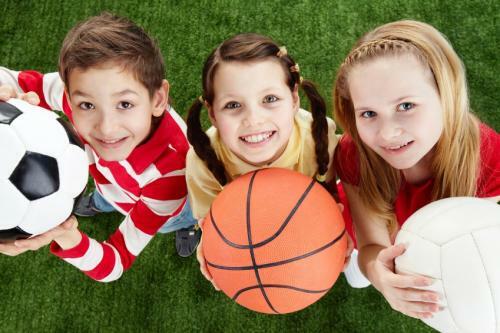 This week's list is Sports Camps, but you can also check out the other camp updates for art, theater, music, STEM, nature, animals, social studies & languages, preschool & special needs, and day camps. (You’ll be able to tell which camp lists have been updated since they will have 2019 in the title, but many camps have the same Web site each year, so the old lists will still get you started to find some great camps.) Many camps don't have their dates/pricing on their Web sites yet, but you can check back later. If you have any to add, please list them in the comments section. Weekly camps end of June through end of July. 9am-2:30pm. Ages 5-13. 7/22-7/26, 10am-3pm. Grades 4-9. Baseball Academy (with classroom instruction to see if Delbarton is a fit for them) is 7/8-7/12, 10am-3pm. Grades 6-9. A week in June. Check Web site for exact dates. 9am-2pm. Activities inside and out. Basketball, with football, soccer, jump rope. Walk to Castle Park. Weekly camps from 9am-3pm. For students entering grades 2-8. Basketball is one of the partial-day session offerings. For grades 3-8. 7/8-7/12 or 7/15-7/19, 10am-3pm. Grades 5-9. Weekly themed camps in July and August. 8am-4pm. Ages 6+. Camp details will be updated in late Feb. Boys and girls ages 13-17. Residential and commuter options available. One week, one-hour unit within day camp (3 or 6- week session). Grades 3-8. Check site for updated camp listing for 2019. In 2018, was one-week in Aug, 5pm-9pm. Grades 9-12. Check site for updated camp info for 2019. For 2018, was 2-5 days, from 7:45am-3pm. Advanced level. Featuring NY Jets and NY Giants players. Overnight and Day Football Camp July 16-19. Roman Oben Lineman Academy July 14-16. Half-Day Specialty Clinic July 16. Ages 7-18. 5-day football camp 7/15-7/19, 10am-3pm, grades 5-9. 5-dayFootball Academy Camp (with classroom instruction designed to see if Delbarton is right for them) 6/24-6/28, 10am-3pm, grades 6-9. Weekly camps June 24-Aug 30. Full day (9am-3pm), half day (9am-11:30am). Early drop-off and extended day offered. Ages 6-14. Multiple one-week camps June 24-Aug 28 from 9am-4pm for ages 5-12. Early drop-off and late pick-up also available. Camp for ages 13-14 also available. Half-day camp (9am-1pm) for ages 4-5. Multiple weekly camps for ages 5-17. Groups form according to age and level of experience, if any. Multiple weekly camps from late June-August for boys and girls ages 7-13. Five week-long camps in June and August. Full or half-day (morning or afternoon). Ages 5-12. Also Private School Hockey Camp from June 17-June 21. July 15-17. Girls camp 8am-2pm. Boys camp 9am-3pm. Ages 7-18. One-week camps for boys and girls. Ages 3-11, grouped by age and ability. Girls lacrosse clinic. 7/15-7/19. 9am-3:30pm. Ages 8-14.. Multiple weekly camps for boys (grades K-6) and girls (grades K-8). Lacrosse is one of the offerings in this sports camp for boys, grades 3-9. Part of the enrichment classes offered in 3-week or 6-week program. Grades 3-8. Multiple weekly camps. 9am-3pm. Ages 10-14 for mountain biking; ride 10-15 miles per day; Ages 9-14 for beginner biking; ride 8-10 miles per day. Sport camp run by Madison High School health and physical ed teachers, Jacquleen Novack, Kevin Lynott, and Michael Radzieski. June 24-28. 8:30am-2:30pm. Ages 5-13. The Multi-Sport Camp is half-day camp that can be extended to full day with specific sport selection. Ages 5-18, broken into age groups. Multiple one-week sessions. Ages 7-13. Weekly camps starting June 24, July 1, Aug 19, and Aug 26. Half day (9am-11am) or full day (9am-1pm) for ages 6-9 and 10+. FUNdamentals program 9-10:30am for ages 3-5. Evening camp also available week of Aug 26. Multiple week-long camps. Ages 3-5, and parent/child for ages 2-3. Pulse Premier Multisport for ages 5-14 located in Livingston. Multiple sports programs offered various weeks, including soccer, running, lacrosse, wrestling, and tennis for boys grades 3-9. Check the Web site for exact dates in June. 9am-2pm. Activities inside and out. Basketball, with football, soccer, jump rope. Walk to Castle Park. One-week camps for boys and girls. Ages 5-18, grouped by age and ability. Weekly Camp Rocks with two outdoor days. Ages 7-14. Summer flag rugby league (not a camp). Matches played in various towns in Morris County. Boys and girls in grades K-9. Check Web site for camp details. Skills Camps for ages 7-14. Mini KICK Camp for ages 5-6. Weekly camps for boys and girls. Ages 5-14, grouped by age and ability. Soccer and soccer/swim summer camp for players born 2013-2005. Positional Summer Camps for players born 2011-2005. US Sports Institute, various locations in Madison, Chatham, Florham Park, and New Providence. Multiple week-long camps. Ages 3-16. July 1-5. 8:30am-3pm. Ages 5-14. July 21-25. 9am-8pm. Girls ages 9-18. Overnight options also available. Camp run by Drew University girls soccer coach. July 8-12. 9am-4pm. Boys ages 9-13. Camp run by Drew University boys soccer coach. Includes lunch and pool time. S6/24-6/28 or 7/15-7/19. 10am-3pm. Grades 4-9. Summer camp information will be on Web site starting in early March. Web site will be updated by late Feb.
Weekly camps. 8:30am-12:30pm for ages 6-8. Various levels of tennis development for ages 5-18. July 8-12, and July 22-26. Ages 7-13. Weekly indoor camps. 9am-3pm, morning and afternoon sessions also available. Ages 4-17. Weekly sessions 9am-3pm, 3pm-5pm. Full day, half day, drop in options. Ages 4-12. JV/Varsity ages 13-18. July 8-12. July 15-19. Aug 5-9. 9am-12pm.. Ages 5-14. 7/22-7/26. 10am-3pm. Grades 5-9. Tennis Academy (with classroom instruction to see if Delbarton is right fit for them) is 6/24-6/28, 10am-3pm.